Lightweight, powerful and reliable. High-speed 360 RPM auger rotation digs holes quickly and cleanly. Kickback is eliminated with torque-free digging. Features a high horse power Honda GX-160 engine with roll cage and 8-inch solid semi-pneumatic tires. Auger not included. This 5.5 horse power post hole digger by Little Beaver is lightweight, powerful and reliable. 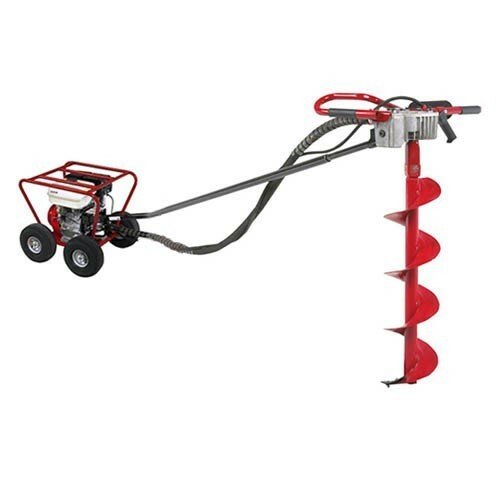 Its high-speed 360 RPM auger rotation digs holes quickly and cleanly. Kickback is eliminated with torque-free digging. A great one-man hole digger for installing fence, landscaping or deck work. this one-of-a-kind mechanical hole digger will last a lifetime. Post hole digger features a high horse power Honda GX-160 engine with roll cage and 8-inch solid semi-pneumatic tires. Auger not included. Applications include fencing, deck work, landscaping, sign installation, soil sampling, and horizontal boring.